A person who lives in foreign country can buy an overseas edition of this book,"Kinkozan Sobei : the story of an Awata Klin ーA study of Kyo-Satsuma, Kyoto ceramics that touched the world" through Amason. However please remind, this book is written by Japanese, not English. URL of the foreign country are as below. However in the United Sates of America the sale of this book is locked now. If sale become available in U.S.A ,let you know in this Blog. And also the kindle edition of this book was published in Japan. This book is a critical biography of master craftsmen of an Awata Kiln, Kinkozan SobeiⅥ(1823-1884) and Kinkozan SobeiⅦ(1868-1927). Awata Kiln is considered to be the oldest kiln of Kyoto ceramics. In the Edo period, KInkozan Sobei Ⅵ was appointed as official potter for the Tokugawa shogunate and his kiln flourished in those years. Because of the following Meiji Restoration, however,he lost his major customers such as shogun and daimyo, feudal lords. In this difficult situation, he made every effort to refine the painting method for pottery and finally developed a new method called "Kyo-Satsuma". The exhibit at the 1867 Paris Expo fascinated the West and a great admiration for Japanese cultures known as Japonism made exports of Kyo-Satsuma ware increase remarkably. In the Meiji period, Kinkozan workshop became the biggest Kyo-Satsuma kiln in Kyoto. After the death of Kinkozan SobeiⅥ, the reputation of Kyo-Satsuma declined.At the 1900 Paris Expo, Kinkozan SobeiⅦ was shocked by new Art Nouveau style ceramics and recognized that Japan was far behind the European nations in the technical innovation of ceramics. Then he started to reform the design and the method of production of Kyoto Ware in order to modernize Kyoto ceramics. As a result, Kinkozan SobeiⅦ achieved a big commercial success of Awata Kiln and established the finest pottery painting "Kyo-Satsuma" in the world. 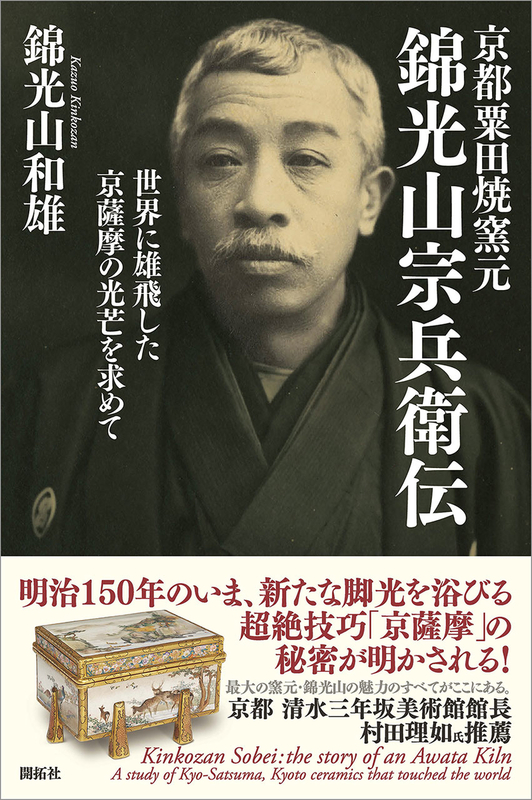 This book also includes a lot of pictures of Kinkozan's magnificent masterpieces and some are very rare of kinkozan factory and his families. Lovers of Japanese Art will find this book full of interesting stories. The author Kazuo Kinkozan is a grandson of SobeiⅦ. Kazuo spent many years tracing back the family history with great passion wanting to inform the world of his grandfathers.This book is written by Japanese.